What are the tectonic features that account for the difference between the North and South Islands? Additionally, how will this boundary develop in the future (geologically speaking)? Pacific and Australia plates meeting at varying angles. If this boundary was straight and the Pacific Plate moved orthogonal to it, then there would only be subduction, as the Pacific Plate is denser than the Australian. Conversely, if the Pacific Plate moved parallel to the Australia Plate there would be no subduction. Along the length of NZ both of these end-members (and variations in between!) are observed, as not only is the plate boundary slightly curved over the length of New Zealand, but the movement of the Pacific Plate has an component of clockwise rotation. Lamb (2011) shows that there has been 70-90 degrees of clockwise rotation of the boundary/margin over the last 20 million years, and it is still occuring today. The differing angles of intersection between Pacific and Australia plate along the length of NZ cause differences in tectonic style, which give rise to differences in volcanism and earthquake occurance and motion. The figure in this section of the Geology of New Zealand Wikipedia page shows the variations of displacement vector (direction and magnitude of motion) along the length of New Zealand. Notice how the vectors are more orthogonal to the plate boundary in the North Island and become more acute in the South Island. Subduction occurs in the North Island because the Pacific Plate moves rougly orthogonal to the boundary with the Australian Plate and is denser than than the crust around New Zealand; the Pacific Plate is composed mainly of basalt, while New Zealand is an amalgamation of different sedimentary and volcanic rocks. As the Pacific Plate is subducted is bends and breaks, causing earthquakes. It also melts, causing volcanoes. 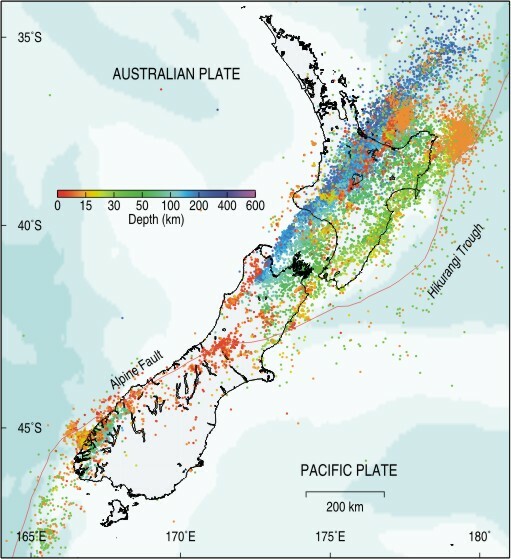 Notice how the depth of earthquakes in the North Island gets deeper to the west - this is due to the continued westward movement of the Pacific Plate even as it subducts under the Australia Plate. Over most of the South Island the Pacific Plate moves roughly parallel to the boundary of the Australia Plate. The Southern Alps are caused by slight obduction (up and over movement) of the Pacific Plate over the Australia Plate. To the south of the South Island the polarity of subduction is reversed, with the Australian Plate being subducted beneath the Pacific Plate (e.g. Randall, 2007). This post is a huge simplification of the tectonics of NZ. The geology of this continental fragment is very complicated, but also very interesting! Have a look at this video to see how the plate boundary has changed over time. Why is almost all the landmass on one side of the globe?